Optimus Prime vs. Voltron - Who would win? 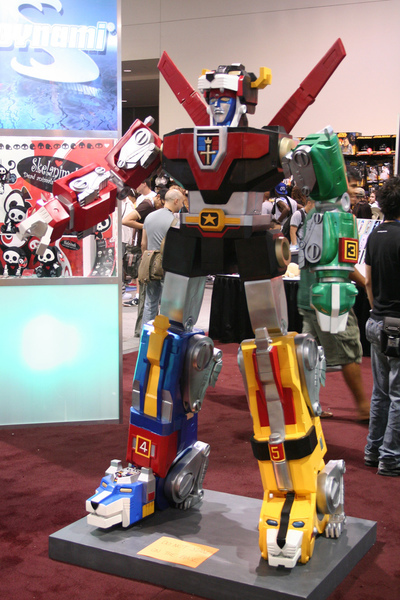 If you remember the 80's cartoons Voltron and Transformers, who do you think would win in a fight between Lion Force Voltron and the Autobots leader, Optimus Prime? Photo by Ewan Roberts, Via Flickr, published under a Creative Commons Licence. I loved both of these cartoons as a kid! Who would win in a fight? I'd have to go with Voltron. He's easily twice the size of Optimus Prime and Voltron could always disassemble over-take him through sheer numbers if needed. I would say definitely Voltron. It's not really a fair fight since it's five against one. Perhaps I should let Optimus Prime pick five other Autobots to fight beside him. I remember watching but not the super powers they had. My son would make me choose Optimus Prime here. Whenever Optimus Prime starts losing, his autobot buddies come to the rescue so if he's allowed backup, then it's Optimus for the win! Fuller House - are you watching? Misfits - If you could have any of the powers from this show which would you choose? The Handmaid's Tale- Is it as good as the book? Favourite episode of the IT Crowd? The Lizzie Borden Chronicles- Have you seen it? Did you watch Double the Fist? What do you think of women being forced into c-sections by their doctors? Would you pursue a long distance relationship?